Alejandro Ruiz is a percussionist, graduated from the University EAFIT of Medellín (Colombia), and a student of several marimba master classes in the United States, Europe and Japan. He has played percussion instruments in various orchestras, bands and chamber ensembles in his native country, Colombia, and has participated in national and international festivals of music with an emphasis on percussion. 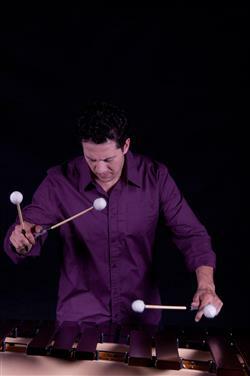 Alejandro Ruiz has performed marimba as a soloist in various theaters in the country, and also on radio and television. He has been involved in musical productions, both in his own town and the rest of Colombia. He has taught percussion at the two most important institutions in Medellín as the music is concerned: Universidad de Antioquia and Universidad EAFIT. In 2011 he participated in the first Keiko Abe’s Latinoamerican Marimba Constest in Chiapas Mexico, where he obtained the second place. He is currently a member of the Philharmonic Orchestra of Medellín, He advises students of percussion in the Antioquia Youth Symphony Orchestra and also is in the second half of Master of Music at the University EAFIT. In his Master of Music he intends to specialize in marimba and raise the instrument to the category of other traditional instruments. He hopes to become known by composers and performers and to encourage them to hold recitals of Marimba music,and make recordings both in Colombian and Latin America. The percussionist Alejandro Ruiz, aims to put a grain of sand in the vast musical landscape that offers the marimba, bearing in mind the legacy He has of the ancestral "piano Choco jungle" chonta marimba. The Colombian Chocó region is bathed by the Pacific Ocean and largely black population. Colombia is a country rich in musical traditions and one of these events is reflected in the aforementioned instrument of African origin whose performers settled in great numbers on the Colombian Pacific coast. With reference to the marimba chonta, percussionist Ruiz will reaffirm the sense of belonging to the Colombian culture and extended to Latin American culture and elsewhere. "All the tunes that you are going to hear are from Colombian composers, and they come with an implicit premise: The sounds of Colombia!" Said the performer, with the hope that they are taking into account the preservation of the traditional Chonta Marimba for future generations of composers and performers to include in their music making. "In the interpretation, I consider of vital importance to use the lesson’s influence I received from Japanese marimba legend Keiko Abe and the other marimbists whom I have had the fortune to take lessons from and be led by the great pathways of the marimba, Always pragmatic, but without neglecting the firm intention to convey the message of the composer in a mystical, wise, respectful way. "says percussionist Alejandro Ruiz. Alejandro is Yamaha artist and innovative percussion artist.